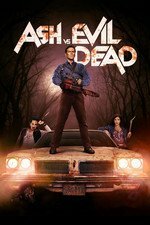 As the power of the Evil Dead sweeps the globe, Ash prepares to meet his destiny. Series finale. Well, I wasn't expecting that. Stupid KoS. I think three seasons ended up being pretty optimal lengthwise. Like a comic book miniseries capturing one set of Ash's adventures. There was a story to tell and they told it. Pablo grew into his own, hooked up with his crush in the end. Kelly's reaction to her family passing violently, her growth, and how she finds some peace in the end. It was a little hagiographic for the Ash Williams character, this last season, though. If Bruce is done with Ash, that was a pretty bitching send off for the character. I think there's enough material there for an animated 'Ash vs Dark Ones.' It'd be too ridiculous for live action. Lee Majors was a wonderful supporting character. Lucy Lawless got a bit more range to work with and less physical stuff. Jill Marie Jones in the first season as the cop was solid. Joel Tobeck as Baal in the second was memorably creepy. Arielle Carver-O'Neill as Brandy was convincing enough - my headcannon is that she epigenetically inherited Ash's resistance to freaking out. Not Arielle's fault, but the writers. This was a fun ride! I've always given it priority queuing as soon as it shows up. I'd still kill for an Ashy Slashy handpuppet.